Bikash Mohapatra looks at Thursday's unusual cricketing event. A rare occurrence in cricket for sure. Something that happened on Thursday, July 29, provides for an interesting statistic; rather it adds to it. While Suresh Raina, after five years of waiting and 98 One Day Internationals, relished his Test debut by scoring his maiden ton a splendid 120 -- against Sri Lanka in the second Test at the SSC Ground in Colombo -- far away at Trent Bridge in Nottingham, another young cricketer, Eoin Morgan, was performing a rescue act for England against Pakistan. The Ireland-born player, playing only his third Test, came to the crease with his team in trouble at 118 for four. A 23-year-old like Raina, Morgan rose to the occasion and steered England to safety, in the process notching up his maiden Test hundred. And it is this occurrence, Raina and Morgan's maiden hundreds on the same day, that gives us an opportunity to look at this unusual fact. 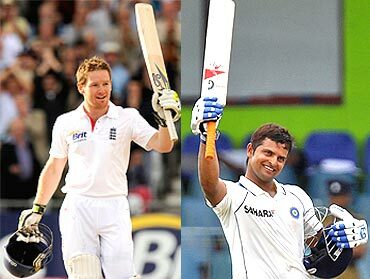 Their maiden tons present only the fourth instance in Test history where two players, their teams not facing each other, have scored maiden Test centuries on the same day. 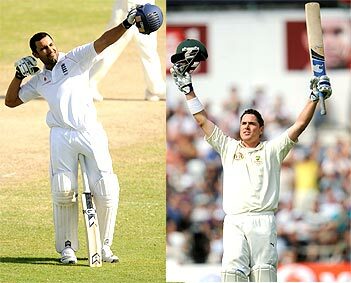 There have been 26 instances overall where two players have scored maiden hundreds in the same Test. But save four, the other instances have either been batsmen playing for the same country or playing for countries playing each other in a particular Test. And that is what makes the Raina/Morgan tons unique. Rediff.com takes a look at the other such instances. The first such instance occurred way back on January 24, 1953 when West Indian batsman B H Pairaudeau's 115 against India at Port-of-Spain coincided with Australia's Chris McDonald scoring a wonderful 154 against South Africa at the Adelaide Oval. It took 52 years for the batting miracle to be repeated. 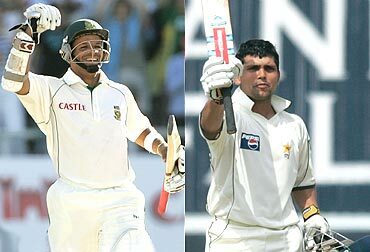 On March 12, 2005, Pakistan wicketkeeper Kamran Akmal's 109 against India at Mohali corresponded with South African Ashwell Prince's unbeaten 139 against Zimbabwe at the Centurion. Since then it has happened twice. On February 27, 2009, fans witnessed Australian Marcus North scoring a magnificent 117 on debut against South Africa at Johannesburg. They will also remember Englishman Ravi Bopara make his Test debut against the West Indies at Bridgetown a memorable one by notching up his maiden hundred (104). On July 29, 2010, Raina and Morgan provided the third such instance in the last five years. Both Morgan and Raina are exciting talents. May they long enhance the game with their skill.